The Oyster system used on London's transport system broke down during morning rush hour, two weeks after a similar fault corrupted 40,000 cards. The latest technical problem affected pay-as-you-go Oyster cards across the Tube network from 0600 BST. At one point, ticket barriers at all Tube stations were kept open as engineers tackled the problem. Transport for London (TfL) said the fault was fixed and Oyster readers were progressively coming back into use. The cards are used as a form of payment across the city on the Tube, buses, trams and the Docklands Light Railway. Passengers touch the electronic card on a reader on entry or exit to a station, or when getting on a bus. "There has been a technical problem with Oyster readers at London Underground stations this morning which has affected Oyster pay-as-you-go cards only," a TfL spokesman said. "Oyster card readers on London Buses and on the Tram network have been unaffected." 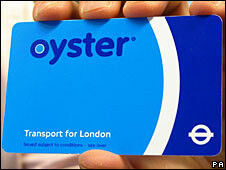 TfL said incorrect data used to update cards was sent out by TranSys, the consortium responsible for Oyster. An automatic refund would be given to any passengers charged the maximum £4 fare as a result of not being able to touch in and out at the beginning and end of their journeys, the TfL spokesman said. He also said cards were not being corrupted as a result of the problem. Valerie Shawcross, chair of the Greater London Authority transport committee, said TfL lost "a lot of money" as a result of the problem. She added: "It needs to be repaid to them. We have to know that this is not going to happen again." A TranSys spokeswoman said "steps are being taken" to ensure the fault does not recur. About 17 million cards have been issued since the introduction of the Oyster system in 2003. Peter Hendy, Transport Commissioner for London, said the latest technical fault left him "incandescent with rage". He said: "We are determined that neither TfL nor Londoners lose a penny from either of these system failures." Have you experienced problems with your Oyster card? Send us your comments by completing the form below.